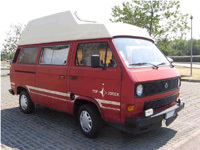 The 1985 / 1986 Volkswagen Watercooled T25 / T3 Westfalia Top Joker Model History. Information about this model is very scarce. 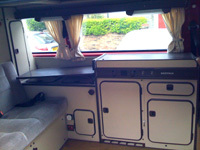 I have found some information on various forums and also from an internal Westfalia staff newsletter that is available to download at the bottom of this page. It would seem that in 1986 model year Westfalia made a limited edition model to celebrate their 35th anniversary. 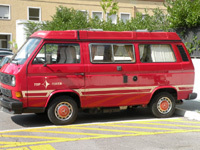 This model was limited to 250 vehicles and was called the Westfalia Top Joker. This model was possibly only available to employees and retired staff. 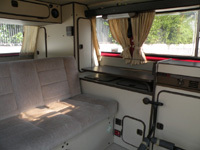 The specification and price was somewhere between the equivalent Westfalia Joker and Club Joker of that period. 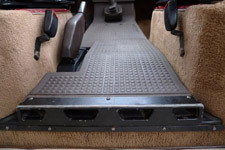 From VW EKTA documentation it is mentioned that the small metal conversion plate (that is on the front face of the rear seat) would have the designation of 216 095 for a Westfalia Top Joker high roof. No mention is made of a pop top version being available. Note that 216 095 is also the designation for the Joker high roof version so the Top Joker does not have a unique number. The internal staff newletter mentions that the base model is the Joker 1 Poptop with additional equipment as standard. For the Poptop Top Joker version it has been seen that the plate has the designation 216 094 which is the same as for the Joker Poptop version so the Top Joker does not have a unique number. If you have any further photos, price lists, sales brochures or information please send them to me and I will update the site accordingly. Note also that the side stripes and logos are currently being sold on ebay so it is possible that if you see a bus with Top Joker logos it may not be genuine! L36Q Rot (Red) This was VW / Audi red available from 1975. As far as I know this red was not used on any other T25 / T3 model. Maybe VW had some left over and decided to use it up ;-) The employee brochure mentions “Rubin” red but as this has a different code than L36Q (the code that was stamped by VW on an actual Top Joker) then I am not sure about this yet. 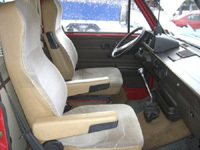 - Interior upholstery light beige with dark brown dashboard and steering wheel. 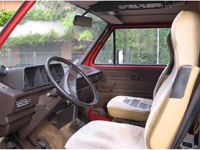 The 1986 model year Volkswagen Westfalia Top Joker had beige furniture with dark brown edging and the upholstery was a beige brown material with brown and red squares. Having the same layout as the Top Joker 1 but with a hightop option. 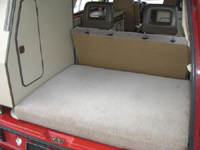 The 1986 model year Volkswagen Westfalia Top Joker had beige furniture with dark bown edging and the upholstery was light beige brown material with brown and red squares. 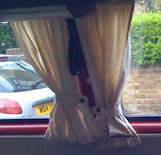 The curtains were a matching beige cloth material. 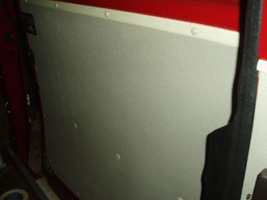 Fibreglass roof painted to match bodywork colour in red. 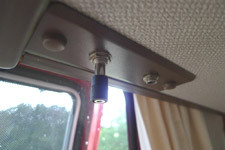 Two 40 cm x 40 cm lifting air vent with mosquito net. 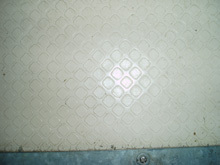 The rear floor was a lino type material. 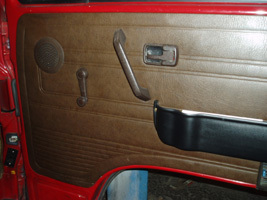 On the 1986 Westfalia Top Joker the door trims were dark brown and seat vinyl were beige brown. Inside sliding door the trim was a beige fibre board material. Insulated on all inner bodywork in the living area with 25 mm thick mineral fibre plates. Floor area has a plywood sheet with PVC covering. The side walls and roof panels are made from lighter imitation leather. All Top Joker 1 pop top seem to have single glazed windows in rear (all had sliding windows in sliding door but one did not have sliding window above cooker). All Top Joker 3 high tops seem to have double glazing in rear. Two transistor lights 12 Volts 8 Watt (under the storage channel on the left over the kitchen unit). All Top Jokers seen so far seem to have Eberspacher 2300 petrol thermostatically controlled night heater with blower installed under the vehicle (uses about 1/4 litre of petrol per hour). 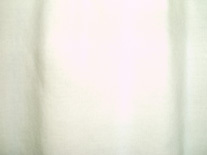 TOP JOKER logos on the outside in ivory colour. 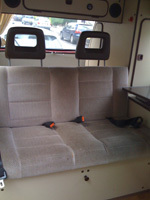 Westfalia Comfort Seats for driver and passenger. 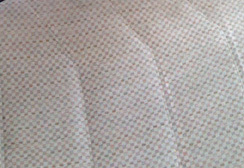 Attractive upholstery (also for roof bed). 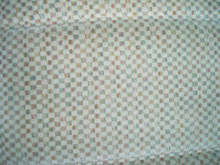 Curtains in material that compliments upholstery. New colour matched PVC flooring in rear. 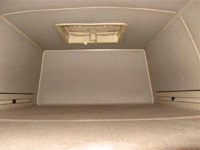 Carpet over the front wheel arches inside the cab area. 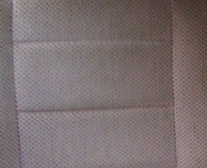 Storage pocket in drivers door. 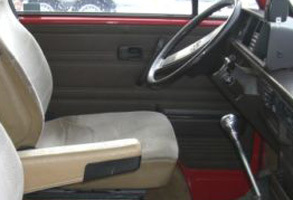 Power steering with smaller steering wheel. Intermittent wipers with automatic wash wipe. 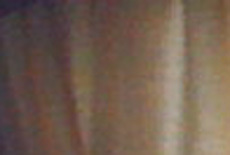 Four loudspeakers- rear with headphone female connectors. Two head rests for rear seat bank. 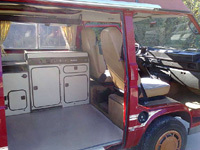 According to the Westfalia staff internal newsletter it was not possible to order any extras for the Top Joker model. VW Westfalia Top Joker side stripes and driver and passenger door decals. Westfalia Wolfsburg factory internal staff newsletter announcing Top Joker model dated 18/04/86 (with prices). PDF format requires Adobe Reader.